My notebooks are in a constant state of growing and changing, layers of me evolving right alongside them. 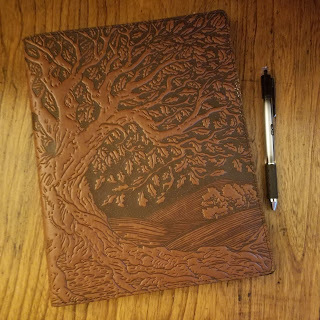 Early notebooks began as diaries and emotional purging mediums, of which I penned much ink during those high school and college years back in the 1980’s. As my children arrived, snippets of their silliness and precious moments I didn’t want to forget were peppered between entries that contained my hopes and dreams as a young mother and wife. I realized early on that my notebook housed what was close to my heart. Some twenty years later, Julie Cameron’s book, The Artist’s Way, would prompt a shift in my notebook writing, and morning pages were born. As a ritual, each morning still, three pages of whatever shows up finds its way to the notebook with the intention to hear the whispers of my soul and receive guidance for the day. 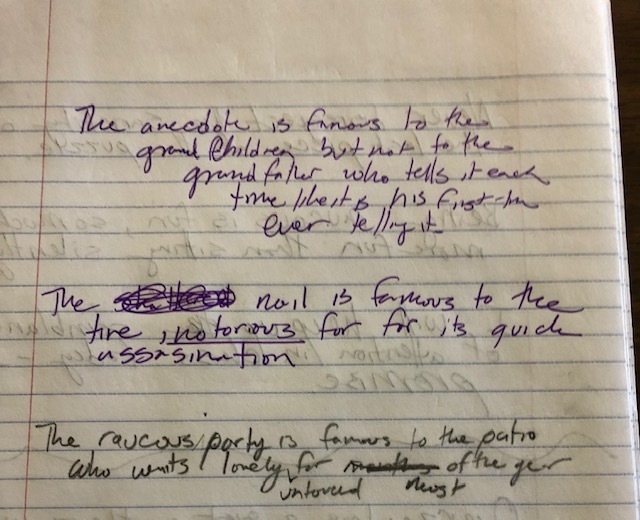 I learned to recognize patterns of whining and emotional drama and discovered that writing in my notebook could pull me out of the sludge; sometimes an anchor, sometimes a buoy. And: what I put my attention towards shaped my life. Later yet, as a newly minted literacy coach being trained at OSU, I was introduced to Ralph Fletcher, Georgia Heard, and Donald Graves, and a new layer of transformation took place. 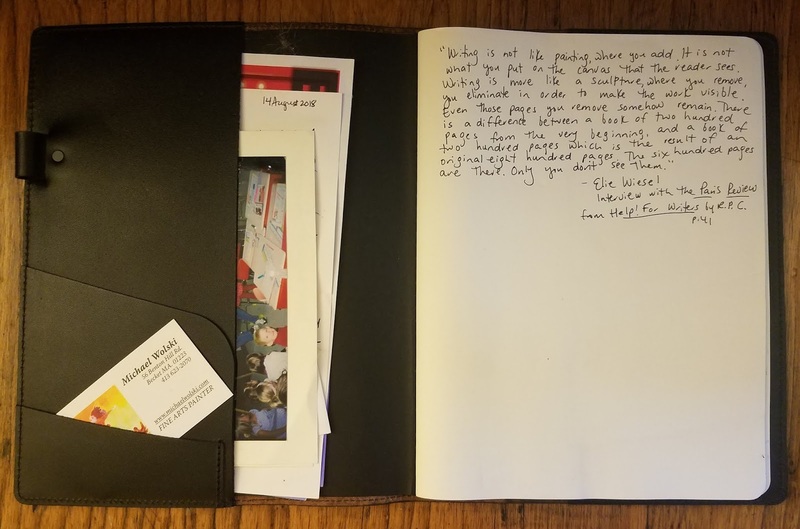 The concept that a notebook is a treasure box housing precious gems, random threads, and collectables to one day grow into something more: a story, a poem, or a book, was my new mantra. Now I was not just writing for myself, but with the possibility that I could go shopping in my notebook for any topic that calls to me, play with it, write deeper into and around it or reshape it for the public. I turned into a "story-catcher," living wide awake for any remnant to be safeguarded in the notebook: an image, dialogue of another (especially my husband - the sharp witted man he is), a random wonder or text message. The world became fodder for my notebook. In the last 5-10 years, my notebooks evolved once again, as they screamed for creativity and meaning. The work of Lynda Barry, Lisa Swerling, Debbie Ridpath Ohi, Leah O’Donnel, and Sunni Brown, Austin Kleon, dozens of children’s authors and Amy of course, inspire the poetry and drawings, doodles and silliness that now pervades my notebooks. I’ve added art journaling, Instagram images, and visual storytelling to be more playful in this space. Mary Oliver’s words to “Pay Attention ~ Be Astonished ~ and Tell About It” feed purpose into my devotion to adding more ink on the page. In a world of “un-noticers”, being one who “makes alertness a hidden discipline of familiarity” (as David Whyte words depict) feels like a special gift I have been granted. My notebooks, for me, and for others I’ve spoken to, have led me to a discovery and documentation of who I am. Following the threads of which I collect, to a larger meaning unearths the hidden treasures of which I learn from and see new perspectives. Words revealed are guidance, often medicine for healing, and quite frankly, just a sweet bliss upon the surprise of the next line. Once that essence is tasted and experienced, it becomes a necessary nourishment for the feeding of my soul. Writing has taught me to live with a sense of presence and awareness of anything that aspires or inspires, creates a sense of wonder, and for what surprises me, shocks me, and disturbs the core of my being. Cultivating a new lens for "seeing" is the first habit of mind for living this writerly life. So, listen to a podcast for words that abduct you, snap the photo of a tweet that calls your name and Paparang it (I'm in love with this new little gadget I bought myself), writing from it to see where it takes you, capture a sentence overheard from your children, or learn to doodle people and make speech bubbles as the thoughts and words. Whatever it be, capture it. Be a witness to the threads of stories around you. If you are just beginning to cultivate a sense of awareness and need a scaffold, I’ve revised Lynda Barry’s tool for paying attention and found it is a good “starter” in teaching the eyes and ears what to look for. Each snippet saved can later be lifted to explore your way into a story to find meaning or some Universal Truth. It’s a lovely strategy in which the only requirement is that you put down your phone and live wide awake in this world. Because, the world is waiting for you. Our lives will pass us by and we will wonder how we spent our days and who we were. Pull out the net and do some capturing of all those sweet butterflies. Thank you so much to Amy for inviting me to share my notebooks. Digging into my neglected blogging space to share past scribbles with you has made me realize how much I miss blogging and a writing community. New nudges are being stirred to venture down some untraveled paths. Dr. Shari Daniels has taught for 25 years in a variety of roles: kindergarten teacher, first grade teacher, third grade teacher, and literacy coach. After literacy coach training at OSU, she felt a calling to graduate school and earned her PhD in Teaching and Learning. Currently, she is an assistant professor teaching preservice teachers at the University of Minnesota in Crookston. Shari is mother of four amazing children who are all following their callings in the world of adulting, grandma to Grayson, who is 2 and 1/2, with a sibling on the way, and wife to her high school sweetheart of 30 years. She hopes to one day live out on a plot of land in the country, with a couple small writing shacks scattered about and maybe raise llamas. She will probably will wear purple. Sharing Our Notebooks is offering a giveaway of a book Shari recommends - POEMCRAZY by Susan G. Wooldridge - for a reader of this post. Please leave a comment by 11:59pm on Sunday, April 7 to be entered into this random drawing. Please be sure to leave a way to contact you as part of your comment. Please know that Sharing Our Notebooks welcomes all kinds of notebook keepers - of any age and interest - to open up their pages and share their process. At the present time, I am accepting all notebook entries and am especially hoping to receive more entries from boys and men who keep any kind of notebooks. If you are interested in writing in this space, please contact me, Amy, directly. 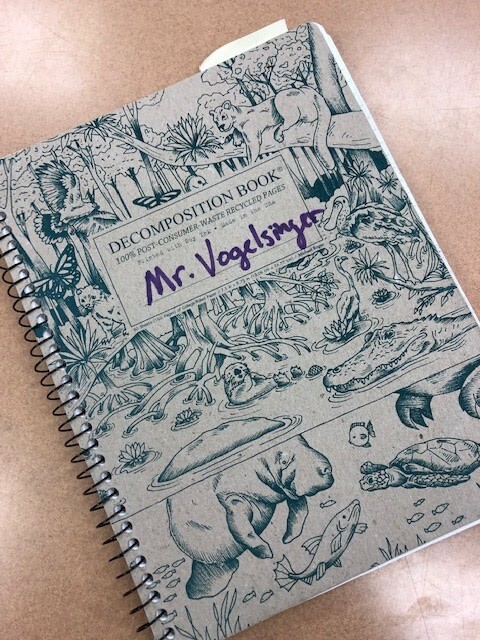 Congratulations to Mary Lee Hahn for winning the Decomposition Notebook! And so many thank yous to Brett Vogelsinger for his wonderful post about his teaching notebooks. If you missed that post, you may find it HERE. Stay tuned for a new Sharing Our Notebooks post, coming this weekend! 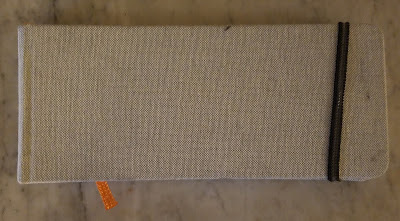 One of the advantages of keeping a writing teacher’s notebook is that I have the opportunity to practice an idea or follow a thread more than once over the course of a day. If I ask my students to respond to a poem or write in the manner of a particular poet, I will do so several times by the day’s end. In my class we respond to a poem in a variety of ways. Sometimes, we write “after” a poet, borrowing a first line and writing a sort of spin-off poem. 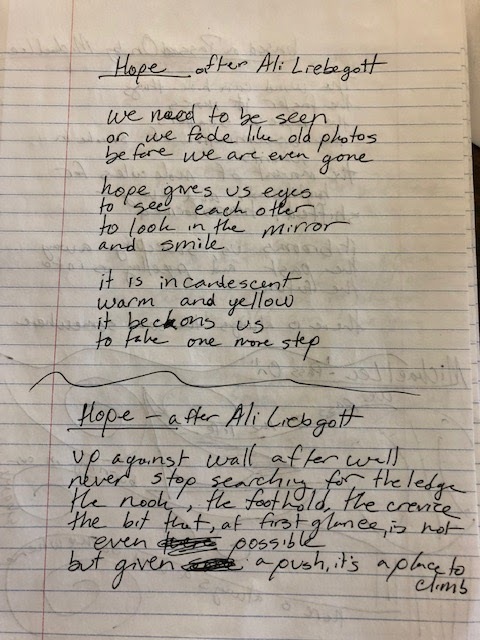 Here are my variations on the poem “Hope” by Ali Liebegott, experimenting with various first lines borrowed from the original. In the following poem draft, I challenged students to write a line that sounds like it is from the poem “Famous” by Naomi Shihab Nye, almost like a “deleted scene” you might find in the DVD extras for the poem. I challenged myself to also incorporates a vocabulary word from our study of the book Night to demonstrate usage. And in this third example, I wrote lines in celebration of small victories or gratitudes in my life that the ending of “won’t you celebrate with me?” by Lucille Clifton drew out in my heart. 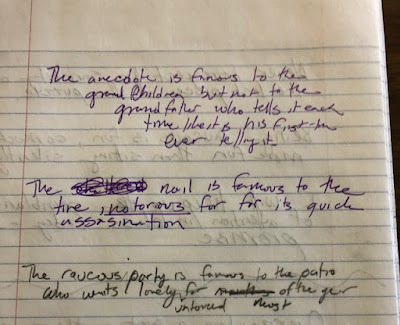 In all three cases, I see my writing change and sometimes grow throughout a given day. From this I have learned that the first idea is frequently not my best idea. It gives me the opportunity to share that process with students the following day. And it reminds me to have students create more than one variation on an idea. 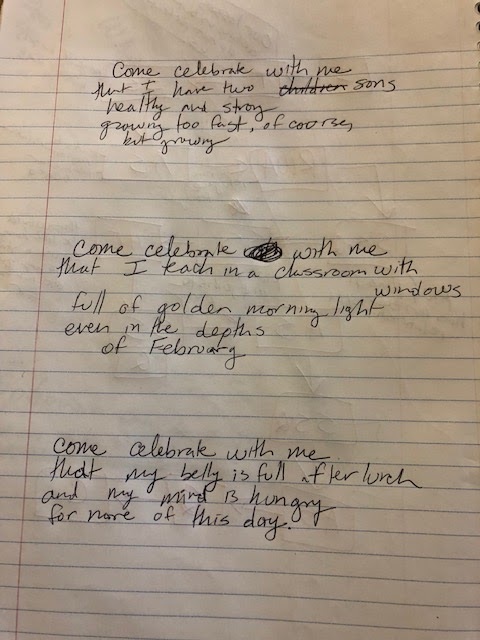 For instance, in the Lucille Clifton model, could students think of three different “come celebrate with me” statements to make about their own lives? Might these be arranged into a poem of their own? Or might we evaluate which one has the best rhythm or the broadest appeal to an audience outside of the Writer’s Notebook? Or might this simply invite greater gratitude and cheer into my classroom? Variations invite possibility, and possibility grows writers. 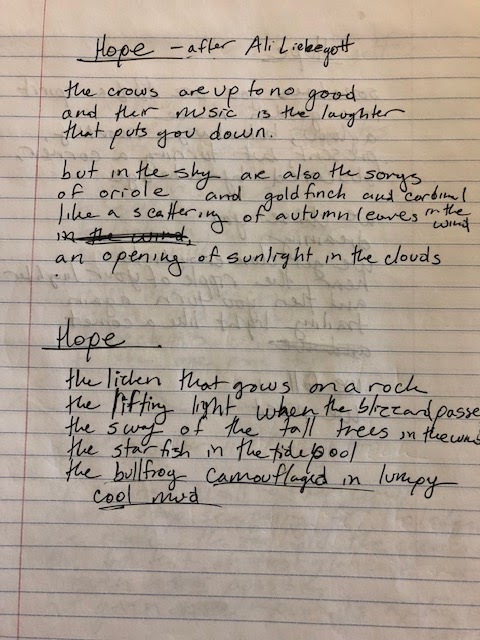 If you are a teacher, find a poem or passage that inspires you and invite a class to write something that sounds a bit like it but also brings in their own voices. Then, repeat this with several of your classes, writing something different each period. If you are feeling especially brave, write under a document camera! If you are not a teacher, then try this same process in your notebook across the space of three to four days, coming back to same prompt from a different angle each time. Your first approach is seldom your best approach. Brett Vogelsinger is a ninth-grade English teacher at Holicong Middle School. 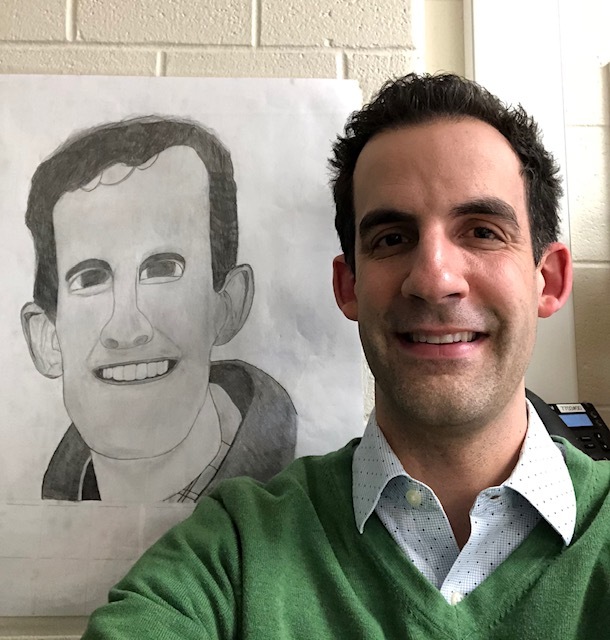 He is advisor of the school’s literary magazine, Sevenatenine, and runs an annual blog project, Go Poems, promoting daily poetry reading in the classroom. You can find him on Twitter @theVogelman. I have been fascinated by the moon pretty much my whole life! An early recollection? When I was about 8 years old, I summoned my older brother to my bedroom. He was six years older and could solve problems for me. I wondered what the light was that glowed on my blanket. He took one look outside, saw the bright full moon in the sky and declared that the moon was actually shining down in through my bedroom window onto my bed. I wondered how that could be. The moon was so far away, up in the sky. I used my hand to create a shadow – and I did. There were no outside lights on the house and no street lights. I actually had the moon light shining in my bedroom. Awesome! On July 20th, 1969 - I recall sitting on the living room floor in my parents' house, watching television as the first men walked on the moon. My father insisted that this was a big moment. He was right. When my sister had kids, I often would point out the moon to them as we walked in their local neighborhood. The days came when they had to move out of the United States, over the Atlantic Ocean, to the country of Luxembourg. I burst into tears when I saw the semi-trailer moving van in their driveway. They were really leaving. For three years I would not see these kids that I had known since their births. How would we stay connected? Before they left the U.S., I told them to notice the moon, especially the full moons. When they saw the moon up in their skies on Luxembourg nights; it was the same moon that I would have here. I told them that I would talk to the moon and tell it to take care of my kids – so far away. I told the kids to talk to the moon and tell “Miri’s moon” to watch over me. I even looked up the names of the monthly moons: Harvest Moons, Blue Moons... Why does the moon sometimes look especially large and close, and sometimes so far away? An orange glowing moon is really special as it fills the sky. So much can be learned about the moon! While my sister's family was living in Luxembourg, my sister, Lori Runk, was aware of her kids' and my fascination with the moon. 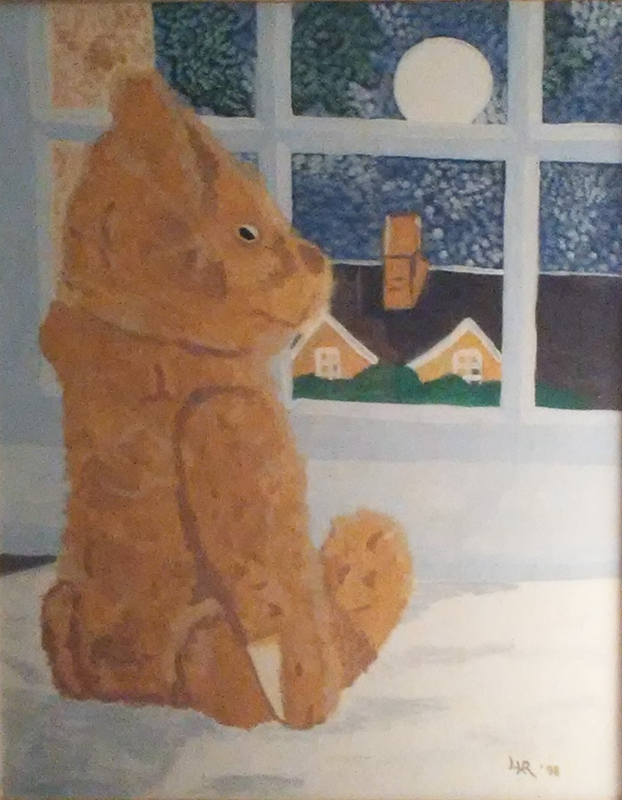 She painted this picture for me. Back on December 20, 2017, I decided that I would like to see if December 21st was really the date that the days started getting longer in Buffalo, NY. I had always been told it was so. Technically, yes is the answer. Daylight is shortest on December 20th at 9 hours, 1 minute and six seconds. Daylight is longest on June 20th at 15 hours and 21 minutes. But, if you look at sunrise and sunset numbers, the story changes a bit. On December 8th, 2017 - sunset times started getting later from an earliest time of 4:41:11pm. Sunrise times started getting earlier from a latest time of 7:47:26am on January 2nd. So, even though December 20th is the day noted for being the shortest, other features of sunrise and sunset are in play. Since December 2017, I have been making daily listings of sunrise and sunset times. I decided that I wanted to know when I was losing the darkness! I enjoy dark mornings when I can sleep in so snugly! To my delight, from December 20th until January 2nd, sunrise kept getting later. It did not come earlier on December 21st! On December 20th, sunrise was at 7:43am; January 2nd, it was 7:47am. I got three more minutes of darkness – for sleeping! Sunrise did not get back to 7:43am, until January 16th. Who would have guessed? So I checked the sunset times. From November 26th, sunset went from 4:44pm to the earliest of 4:41pm on December 8th. By December 20th, three minutes of daylight had been added to my day – back to 4:44pm. By January 2nd, sunset was at 4:53pm. Over the years, I have found many moon items. Halloween has many full moons! Jewelry can be purchased with all the phases of the moon. The full moon is my favorite. Here are 3 pages of my daily notes, from June 17th to August 31st, 2018. For sunrise and sunset hours, I used the daily edition of THE BUFFALO NEWS, but a smart phone will have the information as well. For purposes of writing this article, I supplemented my time recordings with full hours, minutes and seconds found online. Being an accountant, tracking numbers interested me! I have now tracked the sunrise and sunset numbers, as published in THE BUFFALO NEWS on a daily basis, since December 20th, 2017. Daylight times change from a high range of 2, 3 or 4 minutes per day (never 5 minutes), to a low of 0, 1 or 2 minutes per day. Between February 14th (Valentine’s Day) and February 20th - over 7 days we gained 21 minutes of daylight. Days were changing quickly. March 17th had sunrise and sunset times of 7:24 - am and pm. September 26th had sunrise and sunset times of 7:07am and 7:06pm. May 4th, was the last day we gained 4 minutes of daylight – in one day - (the usual was 2,3 or 4 minutes per day) before heading into summer. From June 18th to 23rd, there were 6 days that sunrise and sunset times did not lengthen or shorten the daylight hours. Hmmm… Talk about the seemingly long days of summer? It is true. It feels like the days are long – and there are many of them. From June 20th until 14 days later – on July 3rd, sunset stayed at 8:58pm. Over those 14 days, we only lost 5 minutes of daylight from our mornings. Note: Remember to appreciate June 20th to July 3rd each year – time is yours to spend freely on long days! It wasn’t until August 2nd that we started losing 4 minutes of daylight in one day. August has a knack for catching us off guard – summer is fading away. It really does. Between October 14th and October 20th - over 7 days we lost 20 minutes of daylight. Our earliest sunrise was 5:36am on June 11th. Our latest sunrise was Jan 2nd at 7:47am. Our earliest sunset was 4:41pm on December 8th. Our latest sunset was June 26th at 8:58:27pm. Around April 16th, I decided to start tracking the moon phases. New Moon, First Quarter, Full Moon and Last Quarter. Honestly, I could not have told you the difference between a crescent moon of the First Quarter and the Last Quarter. The difference? The brightness of the moon you see on the First Quarter in on the right side of the moon. Brightness is on the left side for the Last Quarter. So when you look up in the sky at night, you can tell by looking at a crescent moon, as to whether the Full Moon has passed you by or if it is coming up within a few days. I find the full moon fascinating. The brightness is intriguing. Have more odd events seemed to happen in your life on days when the moon was full? Hmmm…. If someone comments on what time sunset is – you know the answer; if you can remember what you wrote down on your daily note pad. I came to notice that there was extra light in the sky 30 minutes before sunrise and 30 minutes after sunset – “Twilight”. Extra minutes every day. I can finish cutting my lawn on cool fall evenings. Even when life doesn’t go the way we like at times, it is important to remember that each night the moon will still be waiting for us up in the sky. On your own, try tracking sunrise and sunset numbers on a daily basis. I did not track the differences in daylight each day until a month into the process. I became curious as to the numerical patterns. Warning - the math does get a little confusing when sunrise and sunset are not both increasing or decreasing at the same time! I could have used a spreadsheet to track the numbers, but did not. I kept the note pad on my refrigerator, so that I could easily record the numbers daily. No rules – create your own format! 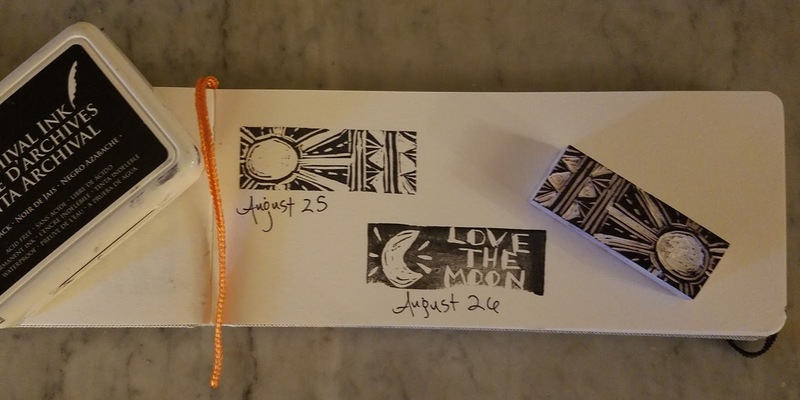 You might also find inspiration through NASA - don't miss this Moon Observation Journal! Miriam Haefner is a moon-interested aunt and accountant living in the Buffalo, NY area. Happy New School Year to many of us! This year I look forward to spending time here, sharing more posts about keeping notebooks, celebrating the notebooks of writers, artists, and collectors of all ages. Writing in a notebook can be a funny thing. At times, I find it difficult to begin. But once I'm off...I'm off, and the more frequently I write, the more at home I feel in my book. It helps me to set aside time each day to write, and it is during this time that I discover who I am right now, what means most to me on this day now. My best rhythm is to begin each day by writing three pages, as I learned to do long ago from Julia Cameron's book THE ARTIST'S WAY. Right now I am writing in this leather notebook. I love that it is refillable and hope to write in it for years to come. I always save the first few pages of a notebook for quotes which I gather from my reading and listening. These are word treasures. I tuck photographs, cards, and other snips of paperlife into my notebook and sometimes glue these right to the pages. At the moment, I am also keeping another small notebook, one I owned for a long time and kept empty for a long time. 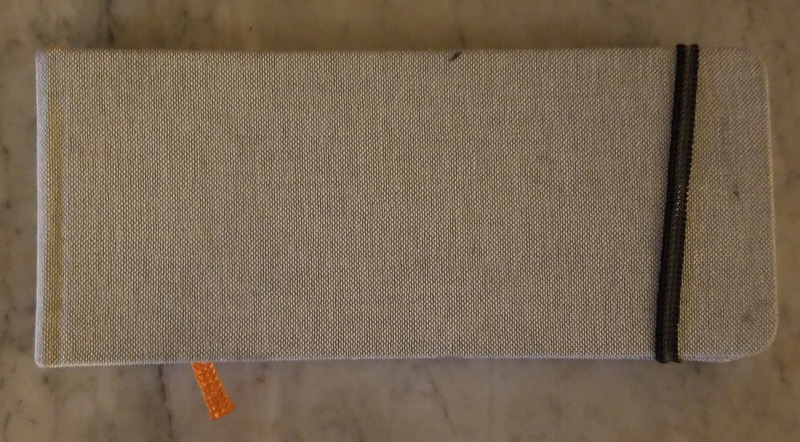 This notebook I am keeping for 100 days. I am keeping it for a special project, one I simply call 100 Carved Erasers. 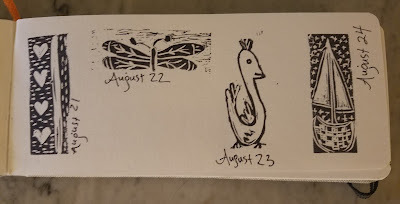 Each day for 100 days (today is Day #39), I am carving an eraser into a rubber stamp. I stamp each one into this book, four per page. 4 Stamps per Page x 25 Pages =100 Stamps! I will use some of these stamps to make cards and perhaps some to make wrapping paper. Mostly, I like carving them because doing this each day forces me to think in images and to play with shape in new and surprising ways. I am also learning that some designs look snazzy when they repeat, and so I play with the stamps in my big writing notebook too. I love peeking into others' notebooks and having the opportunity to share many pages here at Sharing Our Notebooks. Please know that I extend this sharing invitation to you, whether you are an individual or a class of students. If you wish to share pages with readers here, please just send me an e-mail, and I will get back to you. If you are under 18, please send the e-mail with a parent or teacher as I will only respond to e-mails from adults. Please make yourself at home exploring this space; you will find many notebook photos and videos and lists of great books about notebooking. And as the year goes on, I'll be tidying and moving things around a bit to make the site even more friendly. Every page is a new beginning, and I am grateful to my notebooks for teaching me this over and over and over again. How is it possible that May has ended? Amy & I stumbled onto this idea of inviting my sixth-grade students to take over this space and boy did they rise to the challenge. They hustled to get these blog posts written and revised and edited. They did this in a month filled with state tests and end of year craziness. They did this as an invitation with no grade or points attached. They did this with joy and persistence and enthusiasm. Each post inspired me. Each word carefully was chosen. Each photograph picked, especially for the post. I learned things about my students that I didn't know before this #6thgradeblogtakeover. I learned how many of them didn't consider themselves writers before this year. I learned how they share an addiction to pens with me. I learned their passion for writing comes from the freedom to express themselves inside the pages of their notebooks. Each entry delighted me. Each comment brought me such joy. My students. My bloggers. My writers. My notebookers. They showed up. They wrote and they accomplished so much. This challenge reminded me to give them more opportunities for an authentic audience to read their writing. It showed me, once again, how vital that is to writers. Notebookers unite. We notebook-ed all year and we are so grateful for the chance to share our notebooks with the world! Thank you to each and every reader who read our words, especially those readers who left comments. Comments feed writers! We are leaving this month changed and inspired. If we weren't writers before, we are certainly writers now. Let's do it again sometime!